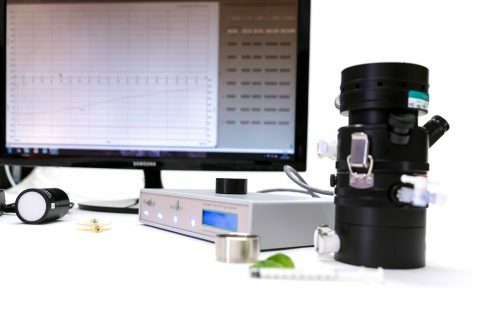 Leafview 1 is an entry-level system for studies of photosynthesis and respiration from gas-phase, solid-state samples under actinic illumination. The system is ideally suited to teaching environments for under and post-grad plant biology studies of the photosynthetic processes but is equally at home in research facilities where demands on equipment performance are high. Samples typically consist of leafdiscs which are either cut from a broad leaf or made up of a “mat” of smaller leaves to form a circular disc of 10cm2. Changes in the oxygen content of the sealed sample chamber are determined by the integral oxygen electrode mounted in the base of the chamber. 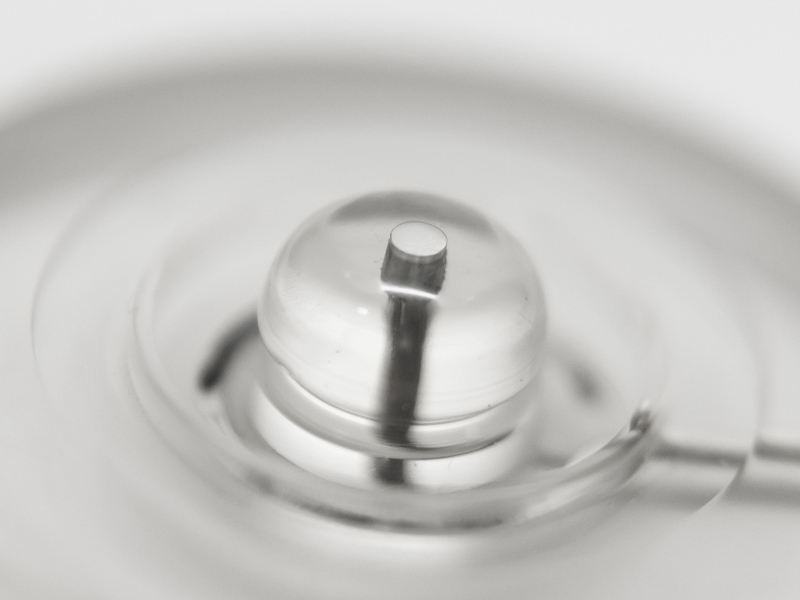 Since its original design in the early 1970s by Tom Delieu and David Walker, the S1 Clark-type oxygen electrode disc remains largely unchanged – a true testament to the quality and reliability of the sensor. The S1 consists of a platinum cathode and silver anode set into an epoxy resin disc and is prepared for use by trapping a layer of 50% saturated KCl solution beneath an oxygen-permeable PTFE membrane. A paper spacer placed beneath the membrane acts as a wick to provide a uniform layer of electrolyte between anode and cathode. When a small voltage is applied across these electrodes (with the platinum negative with respect to the silver), the current which flows is at first negligible and the platinum becomes polarised (i.e. it adopts the externally applied potential). 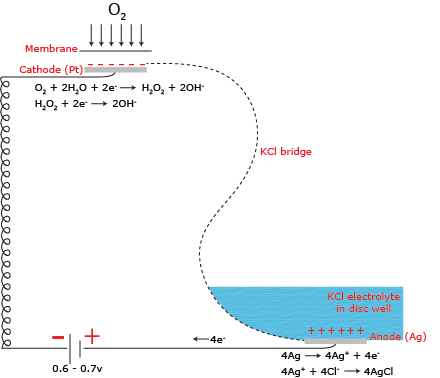 As this potential is increased to 700 mV, oxygen is reduced at the platinum surface, initially to hydrogen peroxide H2O2 so that the polarity tends to discharge as electrons are donated to oxygen (which acts as an electron acceptor). The current which then flows is stoichiometrically related to the oxygen consumed at the cathode. When connected to the electrode control unit, the S1 provides a fast, effective and accurate method of detecting small changes in oxygen concentration. 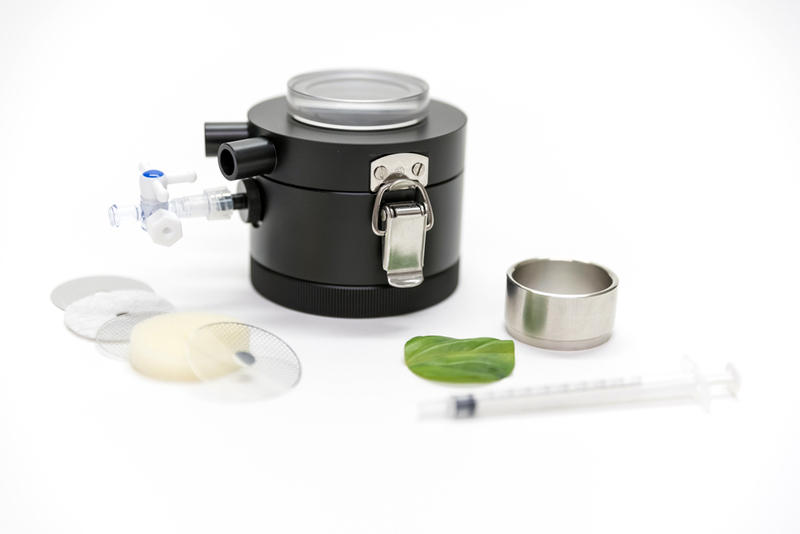 The LD1/2 leafdisc electrode chamber is a simple device for measuring oxygen exchange from a 10cm2 leafdisc mounted within a sealed, gas-tight sample-chamber. The LD1/2 is constructed from black acetal with a cast acrylic top window allowing the sample to be evenly illuminated for photosynthesis measurements using the LS2 high-intensity white light source. A prepared S1 oxygen electrode disc mounts into the base of the LD1/2 with the dome of the electrode forming the floor of the sample-chamber. 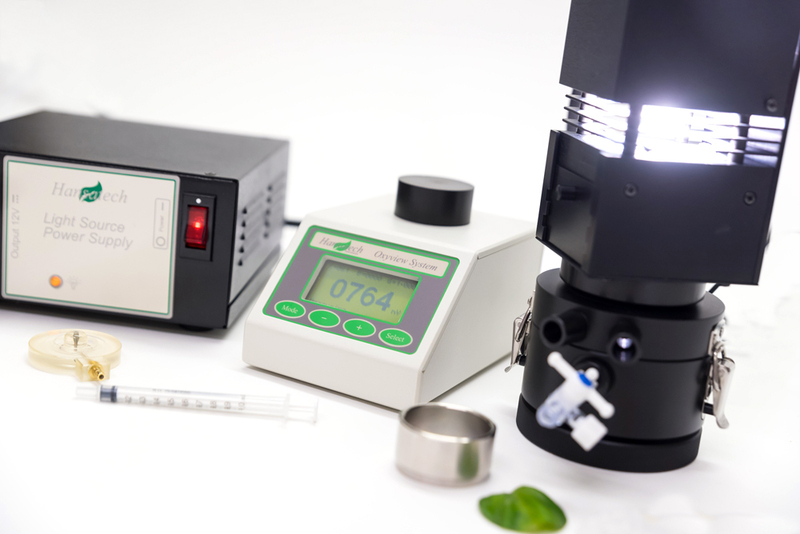 Temperature of the sample can be accurately controlled by connecting an external circulating water bath (not included) to the water jacket inputs of the LD1/2. 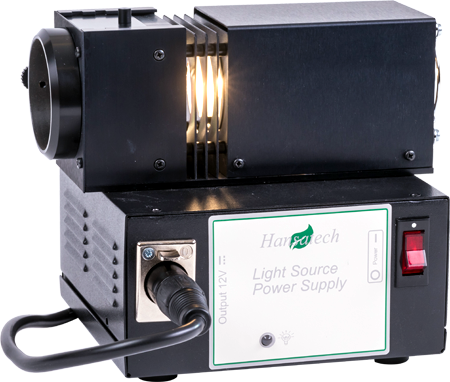 The LS2 light source is a high-intensity (100W) tungsten-halogen light source which is powered from a stabilised power supply. The lamp housing contains a cooling fan, infrared reducing “Hot-Mirror” and optics to provide light with minimum variation of intensity across the beam and little divergence from parallel. 2 slots are provided to accept 50mm square optical filters or a manual shutter-plate. A range of light intensity steps may be achieved by adding permutations of the 4 A5 neutral density filters supplied (0.1,0.3,0.6 and 1.0 O.D.) to attenuate the light intensity. Maximum sample illumination intensities vary depending on the type of electrode chamber in use. When used with the DW1 electrode chamber the LS2 can achieve a maximum intensity of 1,800 µmol m-2 s-1 when mounted horizontally with respect to the electrode chamber. The OXYV1 Oxyview control unit has been designed as a convenient, low-cost oxygen electrode control unit for teaching studies of photosynthesis and cellular respiration using the oxygen electrode measurement technique. 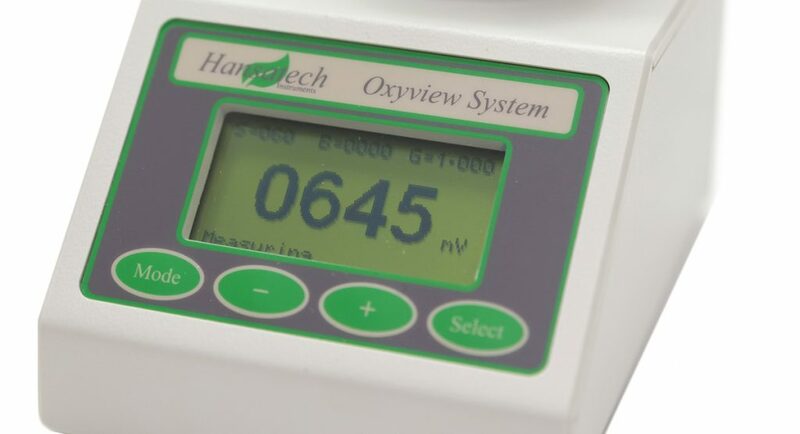 The Oxyview control unit is fully compatible with the range of oxygen electrode chambers produced by Hansatech Instruments thus allowing a wide range of different assays to be performed in both liquid and gas-phases. The Oxyview is configured and controlled via a front mounted control panel featuring 4 touch-sensitive buttons. Configuration is achieved by navigating through a series of simple menu screens and following the displayed guidelines for each step of the setup process. These configuration steps include setting of the stirrer speed (for liquid-phase measurements) and back-off and gain settings. 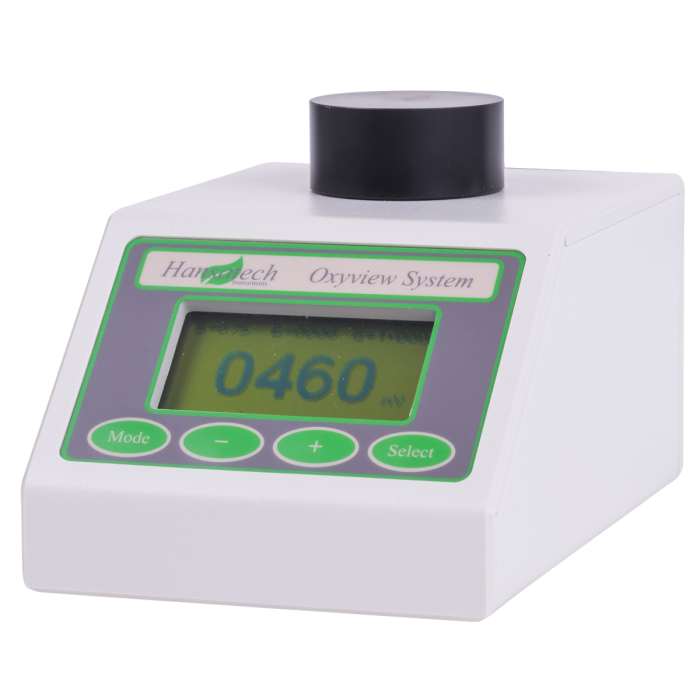 Once configured, the Oxyview control unit provides an accurate and stable reading of the oxygen content of the sample in question. The Oxyview control unit is powered by a 12V DC wall cube which connects directly to the rear of the unit. Also at the rear is a 0V – 5V analogue output. This allows the measured values from the control unit to be logged to an external recording device such as a chart recorder or similar datalogger accepting a 0V – 5V analogue input. S16: Cleaning kit for the S1 electrode disc. Power supply: 86 mmx 150mm x 140mm. Weight 1.4kg. Use the tool below to enter search terms as required. As an example, hansatech instruments Leafview 1 System has already been entered into the search box. Press the "Search" button to view the Google Scholar results for this search string.